Kovrovetz is a Project 266M Aquamarine ocean-going minesweeper. 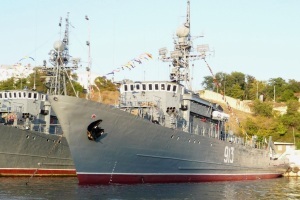 Kovrovetz (serial number 929) was laid down at Sredne-Nevskiy shipyard. Commissioned on November 8, 1974. Since July 1982 named as Kursky Komsomoletz, on February 15, 1992 renamed into Navodchik, on July 15, 1999 renamed into Kovrovetz.